On the hottest days of summer and the coldest days of winter, you want your home sealed tight for energy efficiency. But you don’t want to sacrifice the benefits of fresh air. 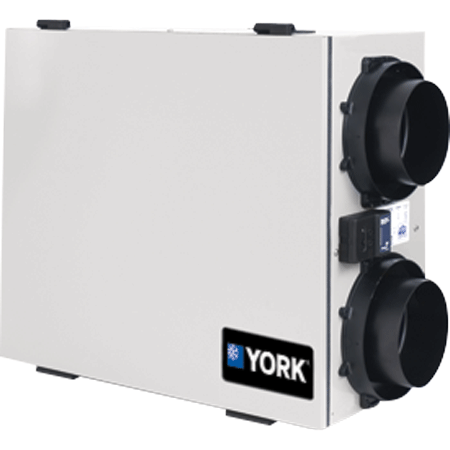 With a York Ventilation System, you don’t have to. 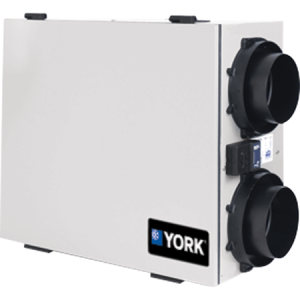 Whether your York Dealer recommends the Energy Recovery Ventilator (ERV) for warm climates or the Heat Recovery Ventilator (HRV) for cooler regions, you can trust these air exchangers to quietly bring in fresh, clean air from the outside and remove stale inside air, along with dust, allergens, and other particle buildup. Replace unhealthy indoor air with fresh outside air. – Powerful centrifugal blower replaces stale, unhealthy air with a stream of fresh air. – Works with your central air ductwork for whole home comfort. – Five speeds meet specific demands. Conserve energy with efficient heat transfer. – Efficiently transfers energy from the exhaust air to the incoming fresh air. – Get more fresh air while running your comfort system less. – Efficient 59 – 66 Sensible Heat recovery. – Reliable performance with proven heat exchange core. – No moving parts in heat exchange core. – Optional defrost package for cold weather. Provide us with your details below and we'll be in touch within 24hrs.